Sorry to disappoint you guys, but this post will not actually be about Cambodia. 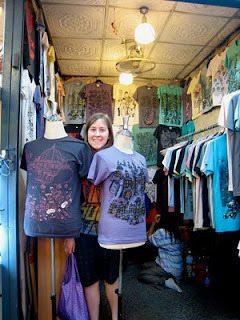 True, Cambodia is in the title of the post, but that's simply what we named our whole trip. I like naming things. And instead of throwing massive amounts of information/stories/pictures at you, I will break our amazing Chinese New Year trip down into several parts. The first part began in Bangkok. 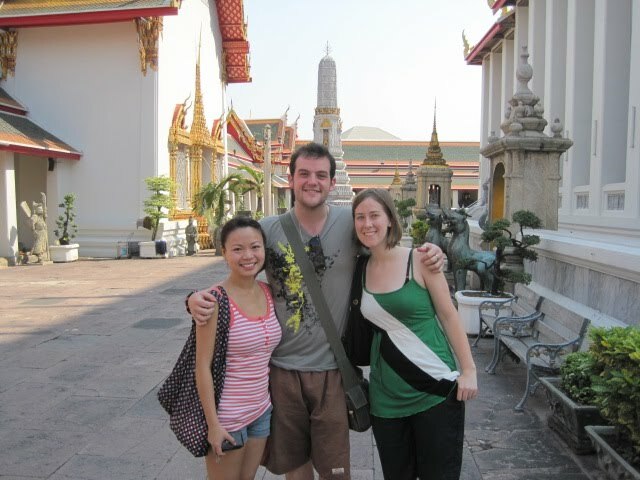 In case you're wondering, we decided to fly to Bangkok and then to Phnom Penh so that we could save a little money and avoid sleeping in an airport/wasting time. I love Bangkok so I wasn't complaining. But let's rewind. I ran to the airport as soon as I got off work on Saturday. The check-in was uneventful, except for the fact that I can now use my awesome Hong Kong ID card to scan in and out. :D Even though it was a short flight, they gave us dinner. I was so impressed! Both our dinner there and back was quite delicious. Good job, Kenya Airways. I give you my stamp of approval. After landing, we went straight to our hostel and went to bed. There was only one other girl in the eight-bed room, lucky us. The next morning we got up ready for a day of marketing fun. 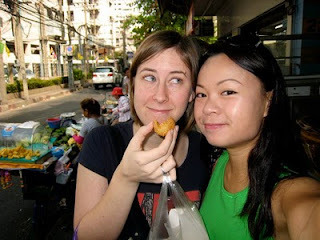 We grabbed a quick breakfast of fried sesame balls, fried bananas, and iced mochas out front. So healthy, I know. Then we were off to Jatujak Market! JJ Market is ENORMOUS! Some of you faithful readers might remember my description of it from last summer. Nothing changed except the temperature. I was thankful not to be dripping in sweat while I shopped. We had talked about doing something else in the afternoon but we didn't. We stayed at JJ for five hours. And guess what? I FOUND THE T-SHIRT LADY! I was so excited. I bought some really awesome t-shirts this summer and wanted another one. It was really hard to find but later in the afternoon I found it! The sweet taste of success. After shopping quite thoroughly, we called up my friend Peter. I met him last summer when I was doing my CELTA course, and he was teaching at the same center. A delightful fellow if there ever was one. We met up with him at Victory Monument and went to dinner at the a little restaurant nearby. Man, that was such a good dinner. But see for yourself. After dinner we got some smoothies, wandered around a market and went to a restaurant for drinks. Us at the monument. 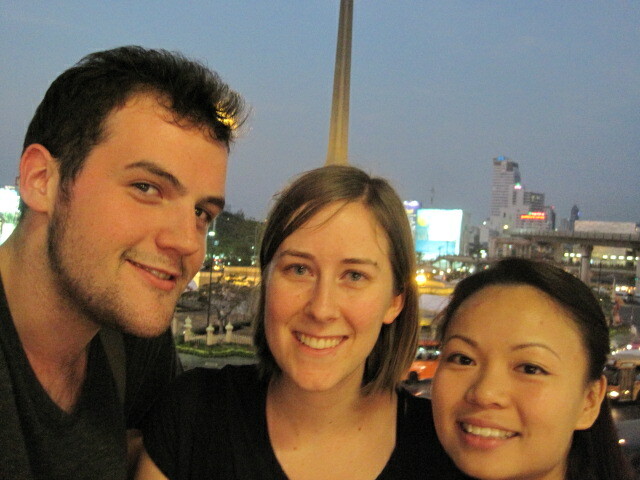 That's Victory Monument sticking out of my head. 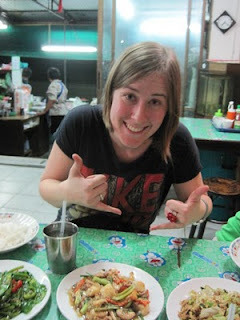 I was excited about the food. 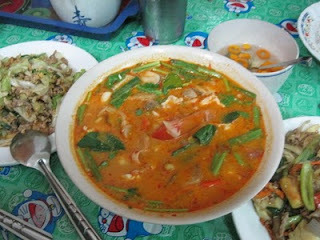 Tom Yum Gai! SO GOOD! The next day we got up early to cruise the river up to Wat Pho. It was Peter's day off, so he was able to accompany us! Lillian and I decided to play clapping games while we were waiting for him at one of the MTR stations, much to the amusement of some ladies around us. I really enjoyed the boat ride up the river, and it was glorious weather for a cruise. After alighting from the boat, we headed over to Wat Pho, a large temple complex. It houses the largest reclining Buddha in the world, or something like that. Lillian and I were both wearing tank tops so we had to borrow shirts to "cover our shame," as Peter put it. Modesty at a temple is a must. 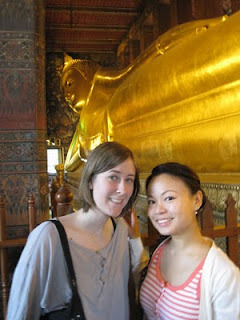 Us, modestly standing with the Buddha. Tom Yum Gai looks good! I've totally been there! 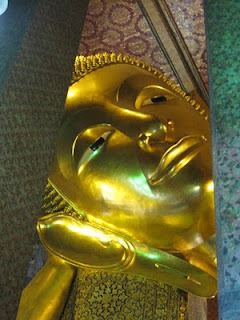 that Buddha was crazy big.